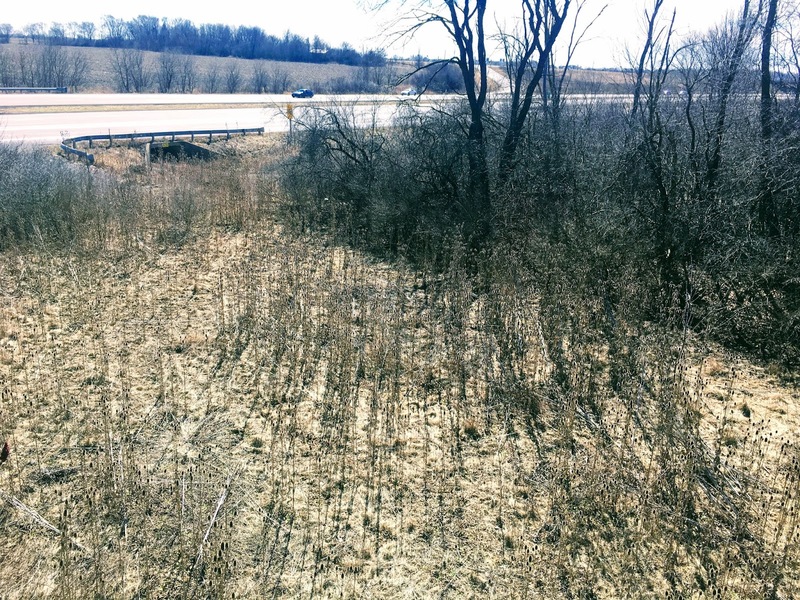 On March 29th, 2016, I would begin the journey to map the abandoned railroad network. 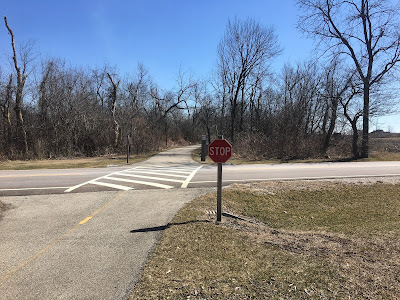 This blog is going to give you a little history of the project, and where it is now, and where I would like it to go. Before I say anything else, thank you for your support. This project would be nowhere near where it is right now without your help, information, and enthusiasm. 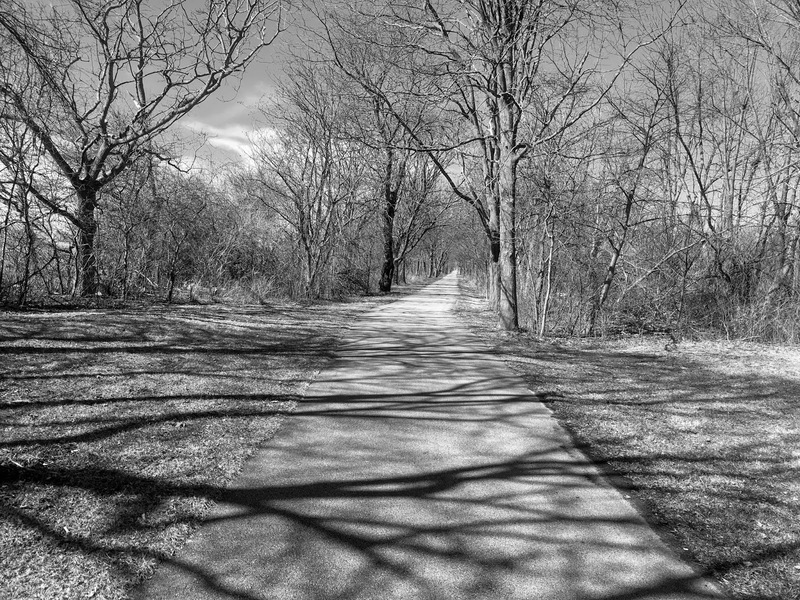 I've had the great pleasure of being able to talk to many of you about abandoned railroad lines, many of which I wouldn't have been able to find myself. So thank you! Before this project began, I would hardly be described as a railfan. I mean, don't get me wrong, I did enjoy trains, however my background is in the traffic industry. 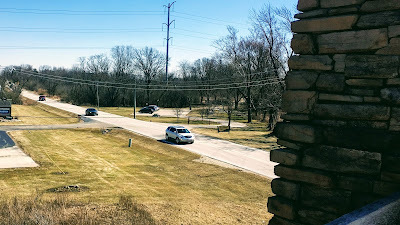 Aside from that, I loved learning the history of our road network, and how roads got their numbers and why they traveled in the direction they did. 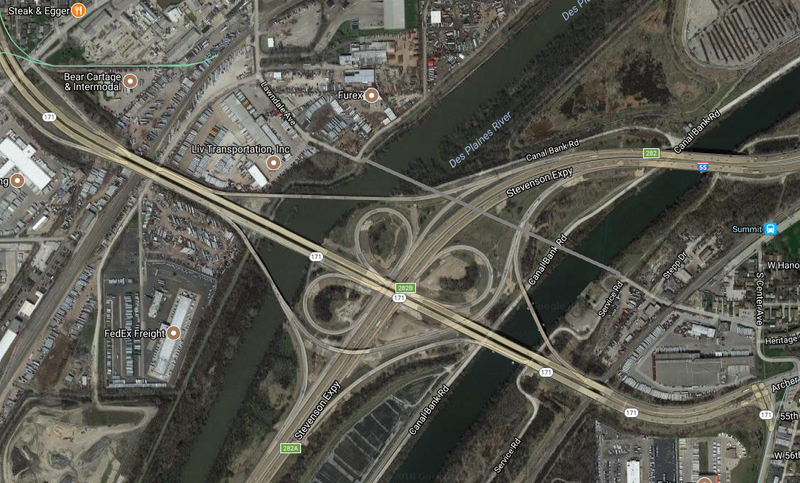 Both the US Route Network and the Interstate Highway System are highly fascinating, to me at least. I honestly found the railroad network too complicated to ever give much attention to, especially with all the mergers and acquisitions that had taken place. 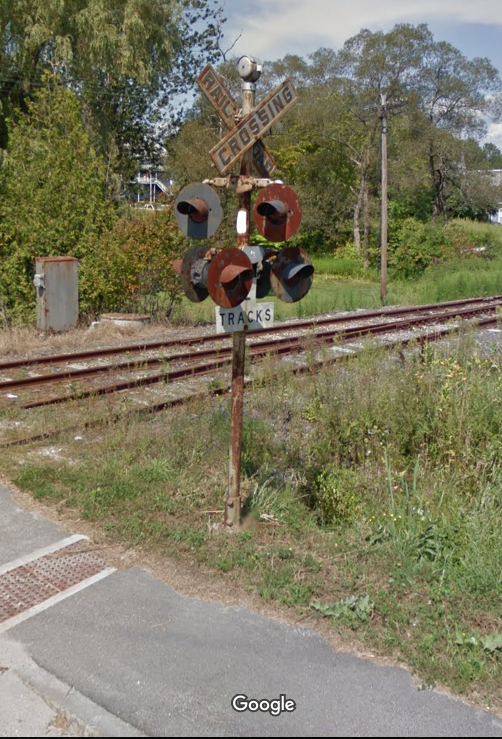 What I did like doing was using Google Maps to look at interesting and unique railroad crossing signals, many of which are older and more dilapidated than our current standards. Google Maps was and is an amazing tool for learning about our geography and history, even if it doesn't appear to be at surface level. 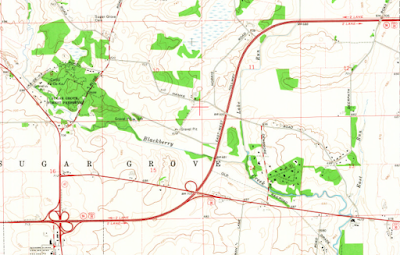 But it was quite easy to trace the older alignments of US Routes, especially Route 66, using an overhead perspective. Perhaps growing up so close to the Mother Road, and one of it's first major junctions from Chicago, led me to this love. 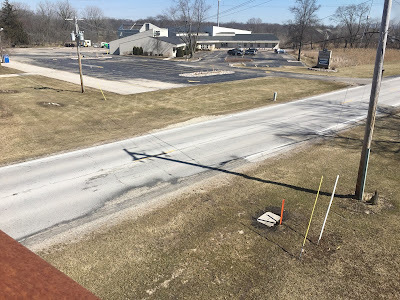 Wherever I would look in Google Maps, however, it became clear that there were lines that could be traced, which would lead oftentimes to centers of towns. These weren't former alignments of roads. 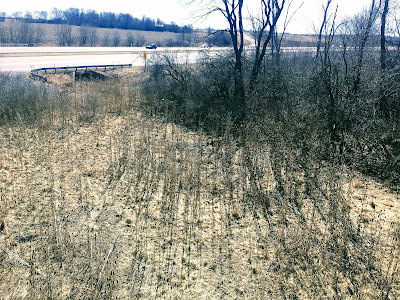 I soon realized I was looking at the rights-of-way of abandoned railroad corridors. Before I started mapping them, I had traced out a few. 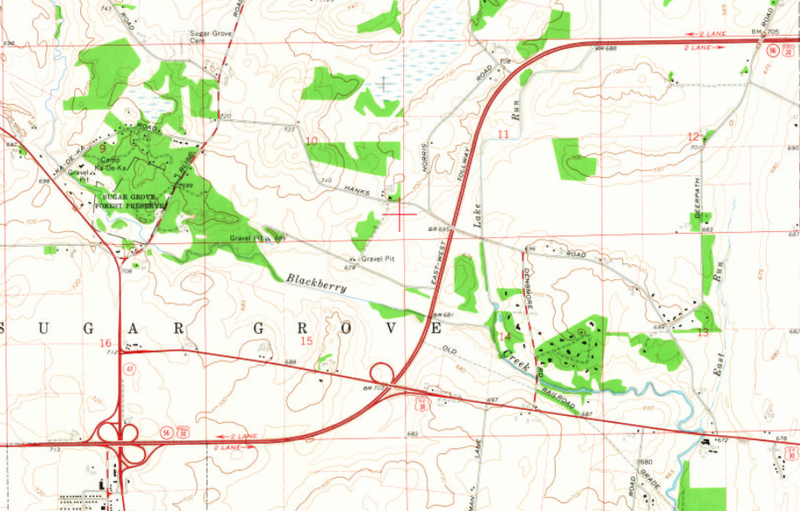 The first one I traced was actually nowhere near me, a former line that ran from Hedges, GA to Gadsden, AL. 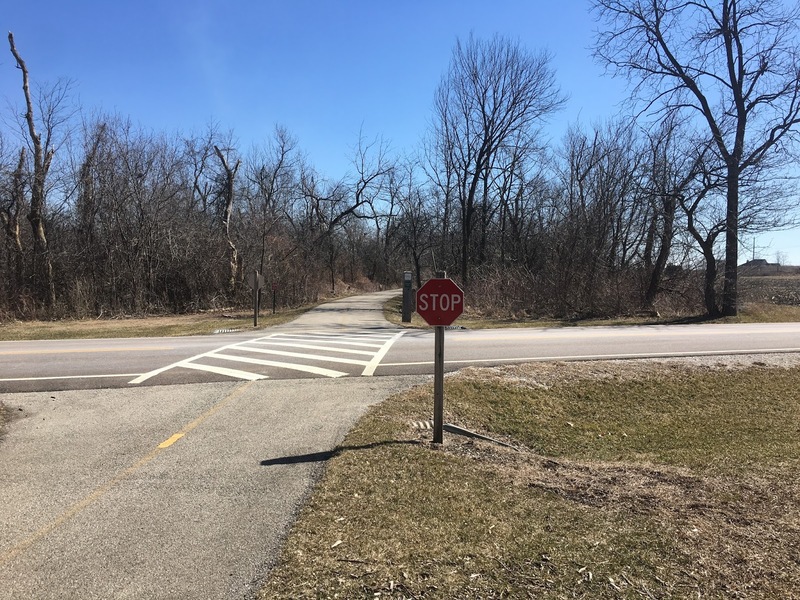 A website, called abandonedrails.com proved I was (mostly) correct in my findings. 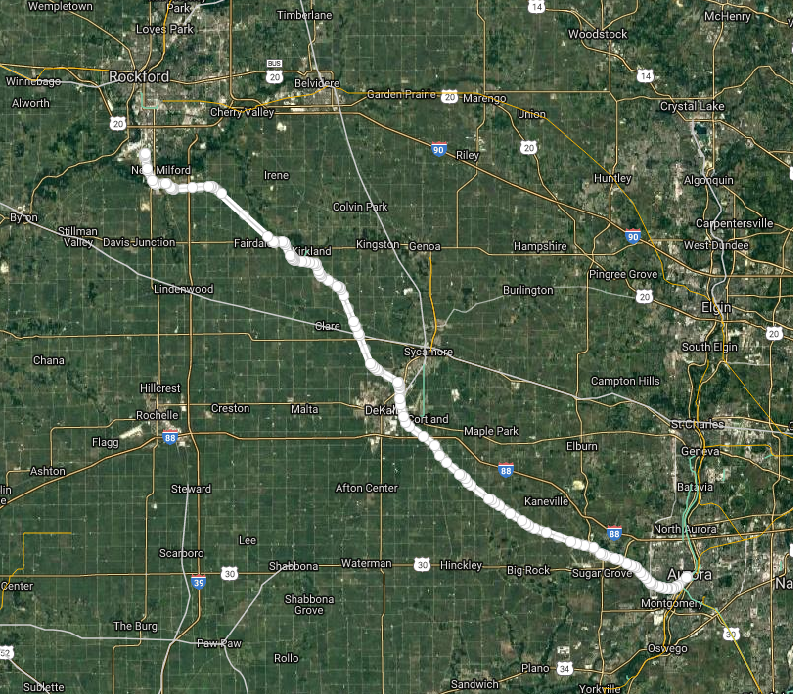 I realized I had become an enthusiast for finding old rail corridors after I'd went for a long walk along the Fox River. What seemed like a rail bridge lay ahead on the trail, and it dawned on me I must be walking on an abandoned railroad line without realizing it. A few more steps and I found myself on the literal doorstep of the Fox River Trolley Museum, a trolley museum which uses the former right-of-way of the Aurora Elgin & Fox River Railroad. 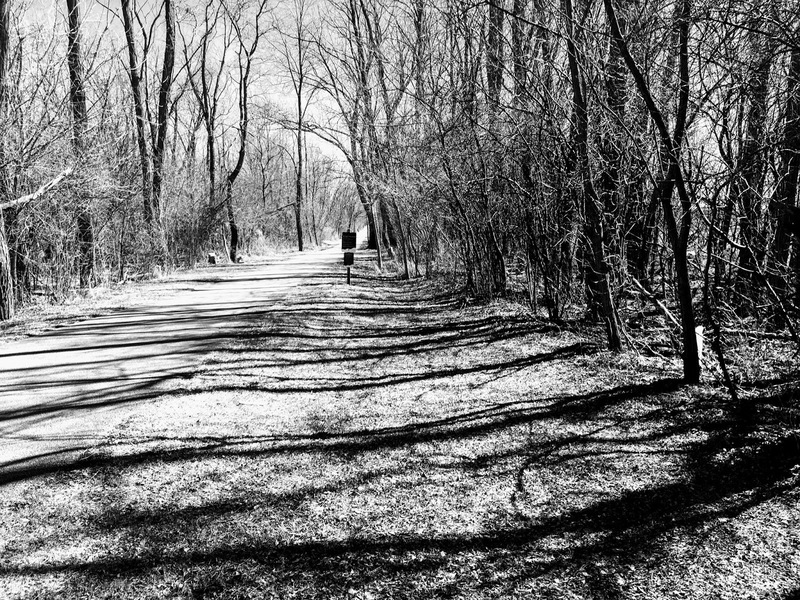 While abandonedrails.com continues to be an excellent resource for mapping abandoned railroad lines, it was most definitely an incomplete source for the whole of the abandoned railroad network. I decided I would map my own traces to remember them for my own use, and eventually I would have a complete map. Two years of mapping has led me to realize just how much of a fools-errand this was, but in my naivete, I decided to create a map of my own, for my own personal traces of railroads. 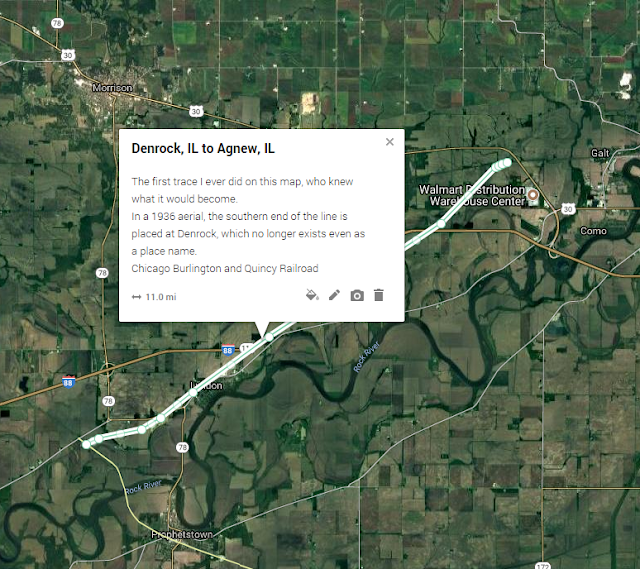 In my first trace of the line, I had no idea of the existence of either Denrock or Agnew, and simply called this CB & Q Line near Dixon. My first traces were only those that I could see, although many abandoned railroads have no trace of their existence left. 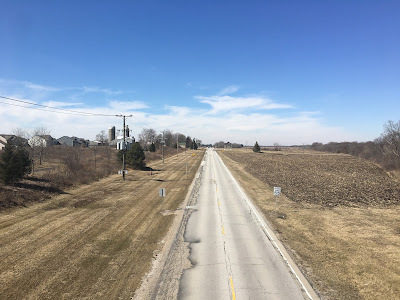 Initially, I was trying to create a map of abandoned railroad lines of Illinois, and I spent a great deal of time looking for a complete online file of abandoned corridors that the state had on record. None existed. Although the Chicago Metropolitan Agency for Planning had a railroad abandonment map, it was only for the Chicago region, and wasn't very detailed. Thus I decided to do it on my own and ignore the possibility that state maps existed for Illinois; besides, it was fun discovering the lines on my own anyway, so I decided to map out a few and go from there. And then I quickly ran into a problem. I had discovered not one, but two railroad lines that led to Wisconsin, and from there, many lines located entirely in that State! And from there, the map became a country wide map. I had remembered reading an article about abandoned railroad tracks washing up on the Jersey Shore, and added them to my map as well. 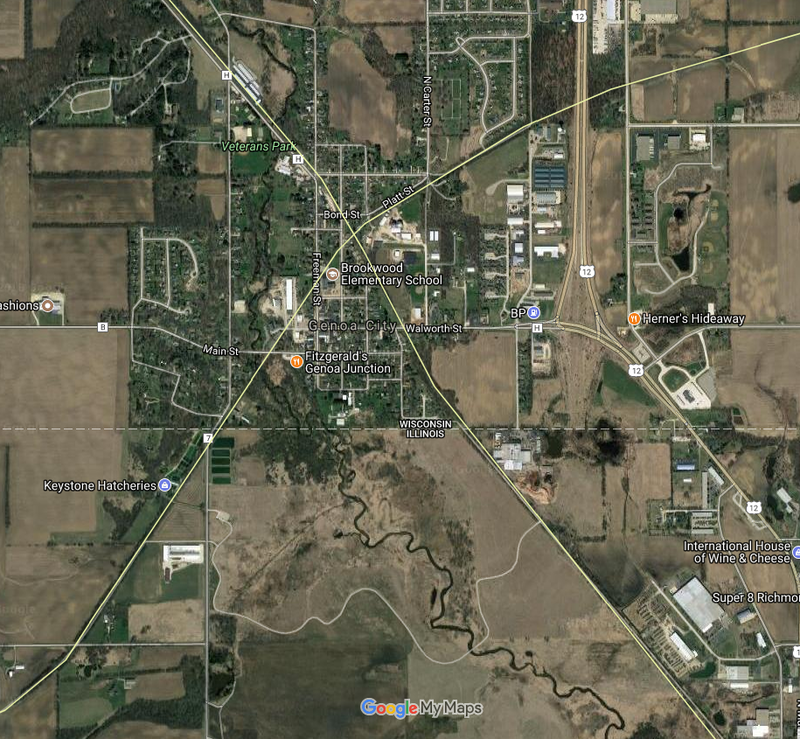 I couldn't find them on satellite view, but decided to post an approximate location anyway, given how interesting I thought they were. 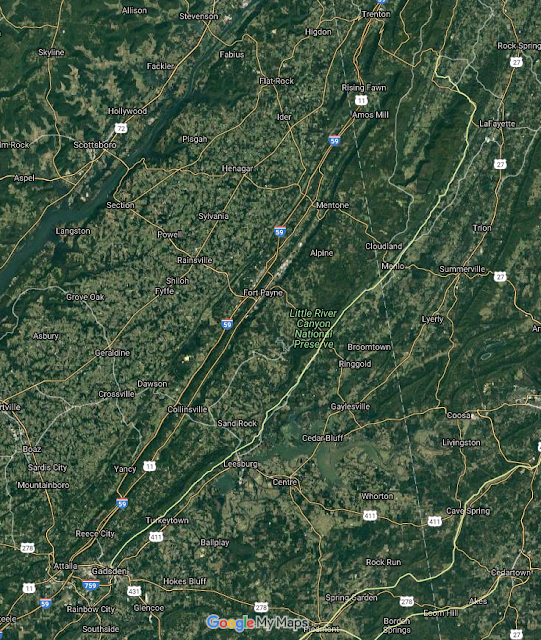 While I didn't know their exact location when I first added them to the map, I eventually discovered the magic of historic topographical maps from The USGS and Historic Aerials. Within the first month, I had traced at least one line in Illinois, Indiana, Ohio, Wisconsin, Michigan, and now New Jersey. Illinois' neighbor to the west presented the largest challenge to the map a short time later. While Illinois did not have a statewide map of rail abandonment, Iowa did. 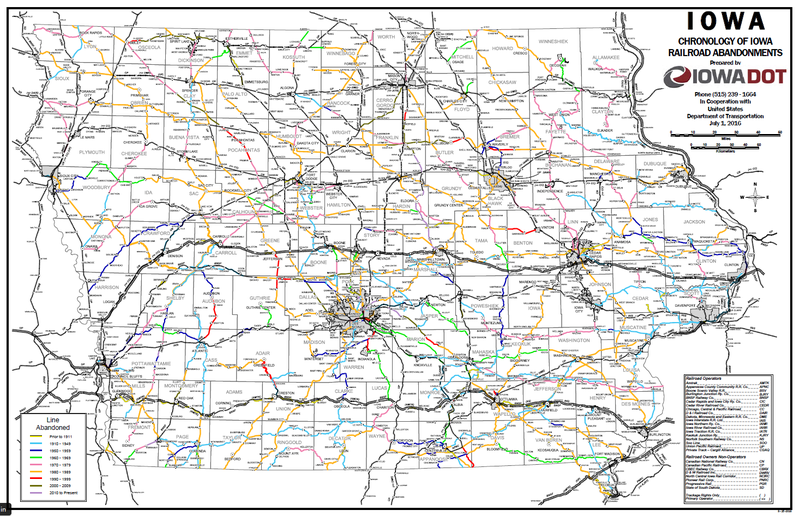 I had decided to begin tracing my first railroad line in Iowa, and after a little research, soon found out I'd have plenty to choose from. I had begun to realize just how large the abandoned railroad network really was. If Iowa looked like that, surely most other states do as well? At that point, the map became another search for mapping data which might yield a complete map. Other than Iowa, only Washington State has a complete railroad abandonment map as far as I can tell, however. Nonetheless, I pushed forward with my own traces. It was mostly a fun side project, not something that I ever thought would go anywhere. Several more months later, my love of Google Maps had me looking at random towns in the United Kingdom, when I came upon a "Railway St" with no railway next to it. 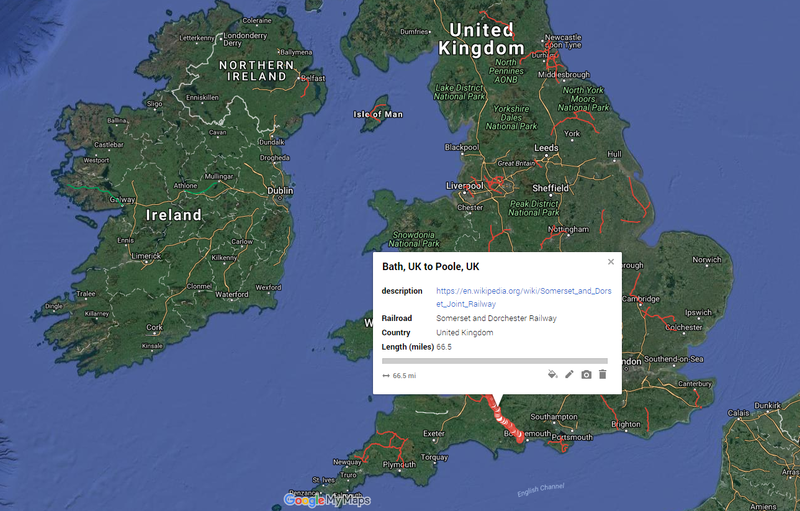 My map had crossed the pond into the United Kingdom, and my map went from US Wide to Worldwide. 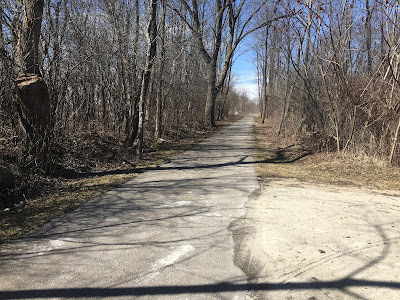 A railroad line linking the Niagara Falls of New York & Ontario, Canada followed a short time later, and I had begun the search for abandoned railroads in three countries. 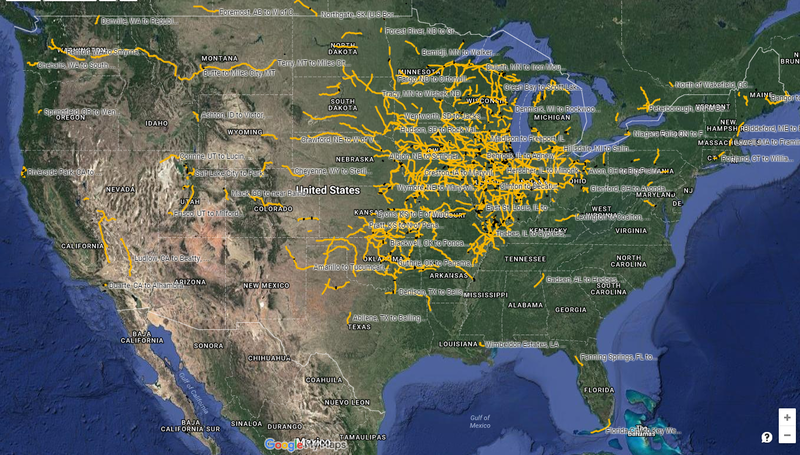 I had the foresight to create a second layer for railroad lines outside North America, which is beneficial, given Google My Maps only allows 2,000 features per layer on their map. I've had to split the layers once again into short lines <13 miles just to keep pace with how many lines I've traced, and will need to split into another layer once again soon. As I grew more familiar with searching railfan websites for information, looking at historic maps, even reading some abandonment filings from the ICC and STB, my map was starting to come to fruition a bit. I'd found a Facebook group for abandoned railroad enthusiasts, and while I didn't do much photography, decided I'd justify my being in the group by showing them my abandoned railroads map. I could not possibly have expected how many people loved it. 50 States, 17 Countries, Over 80,000 Miles, and still nowhere near complete. What had become a fun little side project had become a fun extremely large side project. Even so, it was somewhat contained to the railfan community until Atlas Obscura found it. Harvard University found the map as well. Once again I was overwhelmed with the response. I put my email address on the map so people could input their own lines to me, and about 100 or so people have done so, as of the time of this writing. I cannot thank you all enough for your interest and help! I started blogging and created Forgotten Railways to help spread the word about abandoned railroads, ideally to a larger audience, who might be interested in learning about what once ran through their town, trace or no trace, or why a certain group of houses looks different than the rest of the block. It has truly been an amazing experience to be able to learn about abandoned railroads all across the world. At the moment, I have mapped about 65% of the abandonments of the United States Railroad network, although even so, there is plenty more to find even in the Midwest. The map has grown to be larger than that of abandonedrails.com, and has a global perspective. As I try to provide links to outside resources as well as the owner(s) of the railroad when it ran, the map provides more contextual information than the abandoned lines of OpenRailwayMap. The end goal of the project is one that will never be achieved. 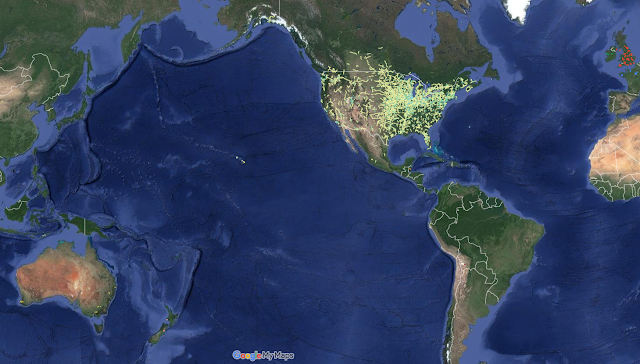 That is to map every railroad abandonment in the entire world. I have several ideas that we, together, can strive toward this goal together. This blog and the map are two separate entities, even if they both ultimately help to inform others about railroad history and abandoments, but in my mind they are separate projects. 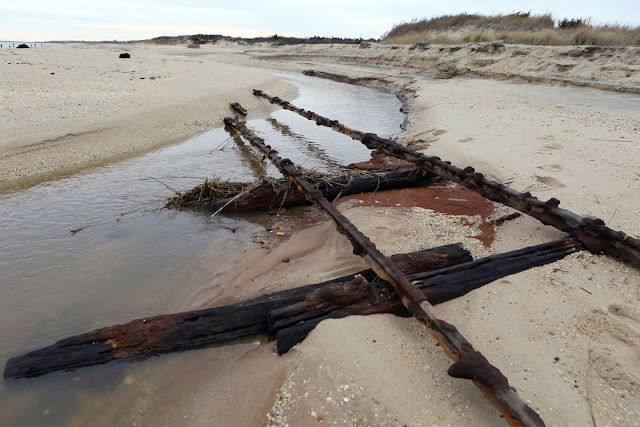 I would like to create an app which would allow users to view the map at their leisure, as well as alert them when they come in contact with an old right-of-way, and most importantly, allow them to add their own knowledge of the abandoned railroad network to help complete the network. Lack of programming knowledge and developing a quality control system are the two biggest setbacks to this end. Additionally, I am trying to narrow down the scope of a book on abandoned railroads. I believe there is more than enough material to write one, it is just a matter of figuring out what material will entertain and inform a wider audience of the story of abandoned railroads. As always, your contributions, suggestions, knowledge, and information is always welcome and appreciated! Scarchitecture, a portmanteau of the words scar and architecture, is somewhat of an internet buzzword. 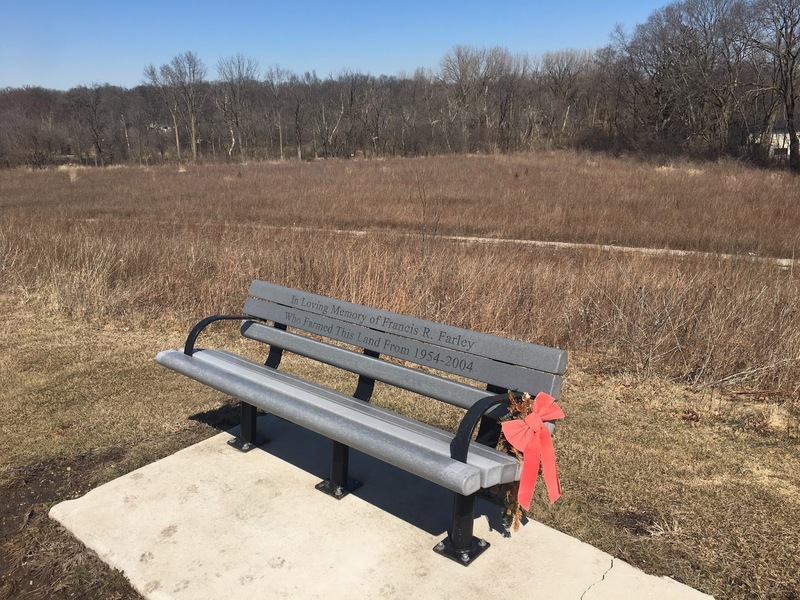 It refers to the remnants left behind by abandoned or disused infrastructure or old buildings, and how one can find, using satellite imagery, evidence of old roads, railroads, and all sorts of remnants of a city that once was. This blog post from 99% Invisible explains the phenomenon far better than I could. 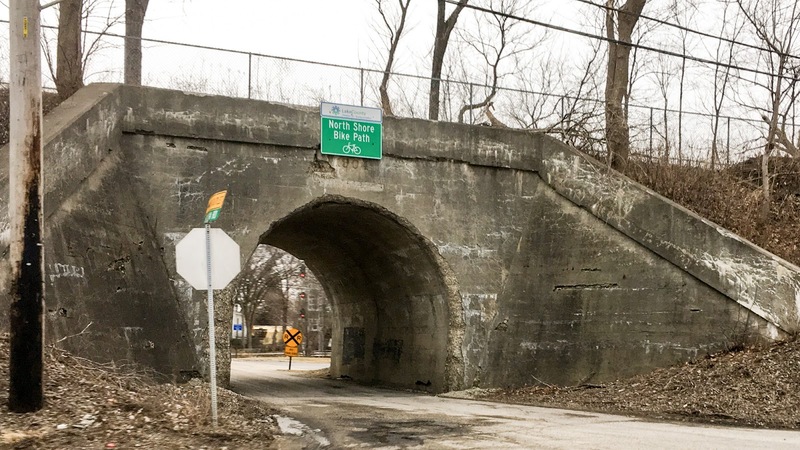 Applied to the old rights-of-way of railroad corridors that ran in the urban core, one can see examples in nearly every corner of Chicago, as well as many other cities. 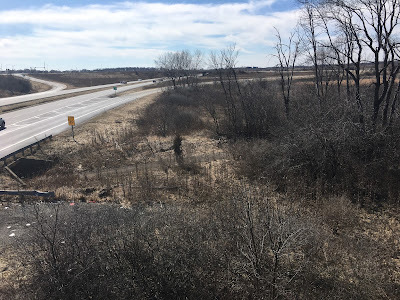 Of course, not every abandoned railroad right-of-way leaves a scar, in fact I was quite surprised to learn that Chinatown Square occupies what was once a former rail yard of the Atchison Topeka & Santa Fe. 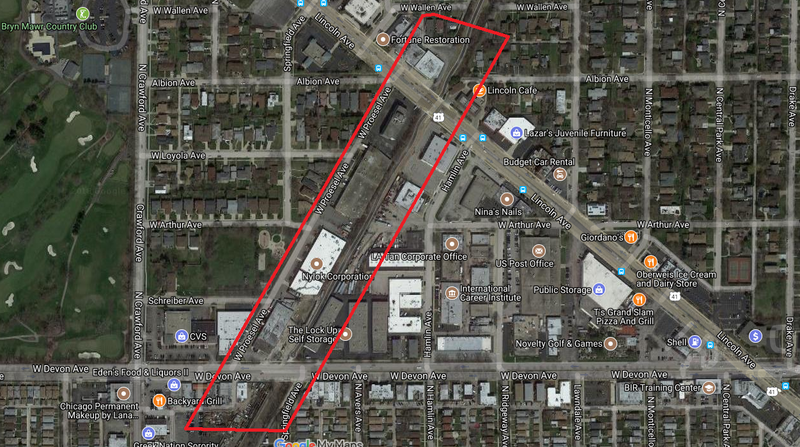 In fact, much of the industrial area east of the Chicago River was once home to various rail yards, with very little, if any evidence remaining of their former lives. 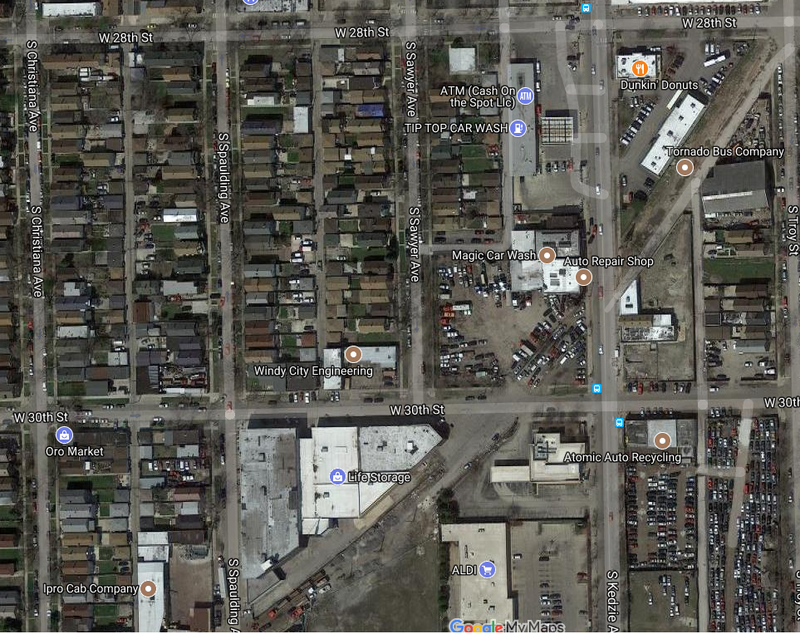 It is also impossible to trace the abandoned streetcar network of the city relying solely on satellite imagery alone. 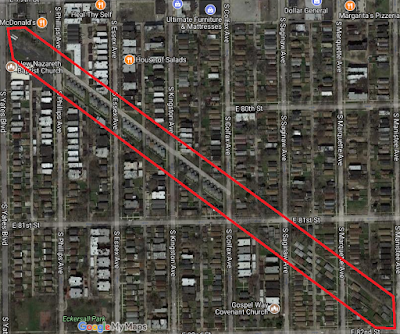 That being said, the railroad network of Chicago is so large, and was even larger in the past, that there's plenty of scarchitecture to be found. 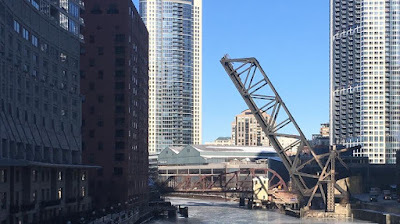 In the sense of being able to find abnormalities with the buildings and roads around it, the Kinzie Street Bridge doesn't qualify as scarchitecture. But it is a remant of the Chicago & Northwestern's role in the development of the area around Merchandise Mart. This line actually traversed under quite a few buildings en route to Navy Pier. It was never technically abandoned, although the last time this bridge had any activity was for the Chicago Sun Times in 2000. Along with the still in-use St. Charles Air Line Bridge, the B&O Railroad owned an adjacent bridge as well. This bridge is permanently in the upright position. It is quite easy to note the abandoned approaches to the bridge. 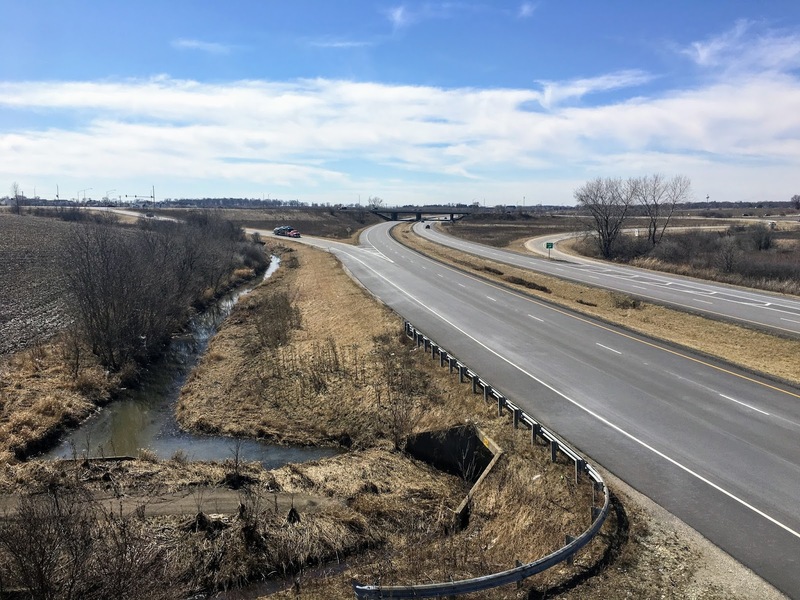 It is at this moment considered abandoned, however it is also being considered for use if any additional high-speed rail projects materialize. 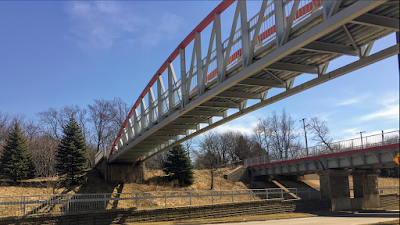 This bridge is quite easy to see for people traveling on the Metra and Amtrak lines leaving Union Station to the south. 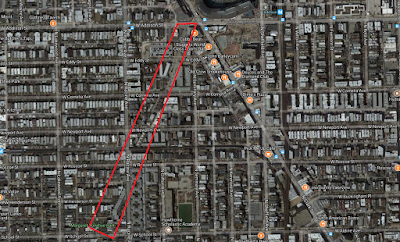 A bit southwest of Cook County Jail, the remnants of an abandoned line that once fed into BNSF's Corwith Yard can be spotted, as well as buildings which are cut in odd-angles nearby. 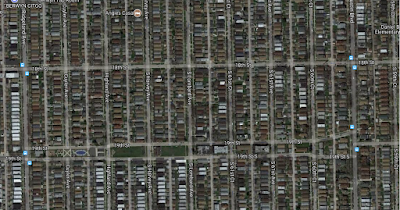 Another great example of scarchitecture can be found on the south side around 81st St and Yates Blvd. 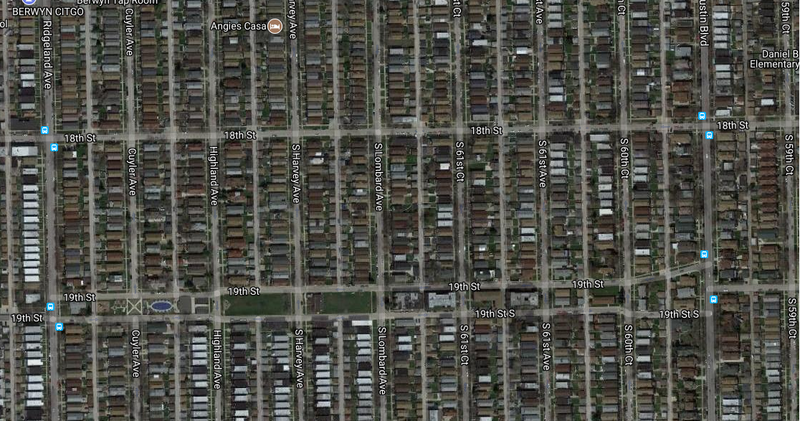 The Brookdale Branch of the B&O's right-of-way is currently a few different housing developments, all of which do not conform to the homes on the grid all around them. 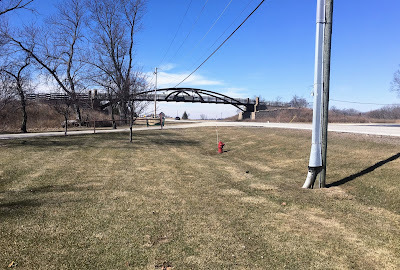 As stated earlier, scarchitecture is not simply a phenomenon related to railroads; this was the former road bridge in Summit, IL along what is present day IL-171. Back in those days, this was IL-4, IL-4A and IL-213. 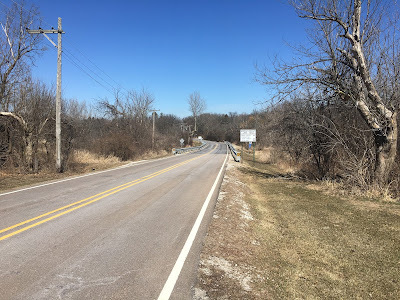 Another interesting fact is that, although the roads to the east and west of where the former bridge was are now primarily industrial roads with little traffic, IDOT still maintains them. Scars of former infrastructure exist not just in the physical world, but in governmental agreements as well! Back to railroads again. 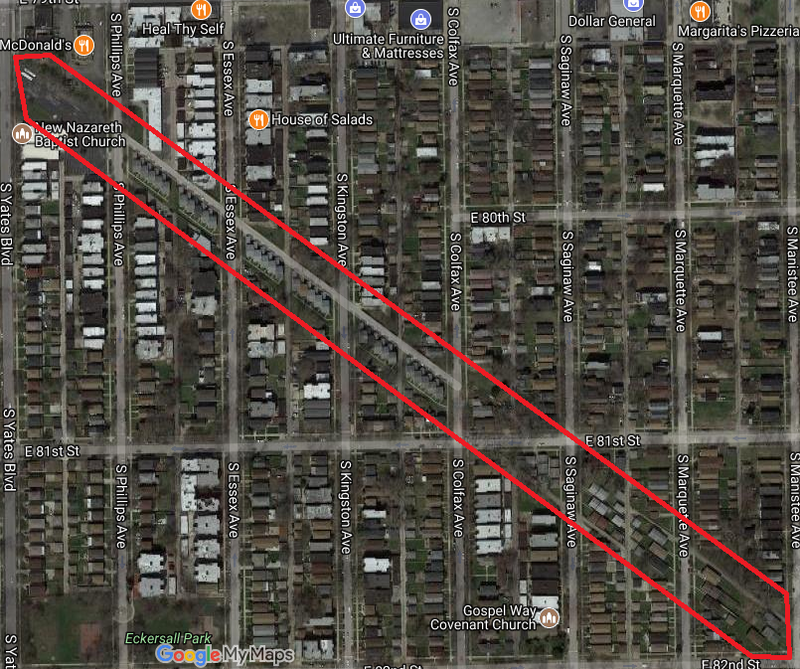 19th St in Berwyn and Cicero between Austin and Ridgeland is built to occupy the right-of-way of a former electric line, what I believe was the Chicago & West Towns Railway. 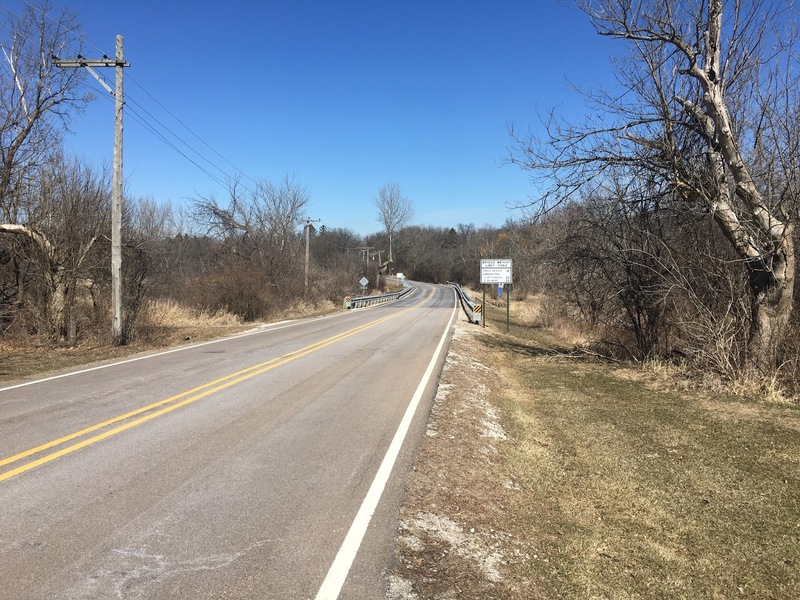 It's most noticeable at Austin, where the north side of the road strangely turns for no apparent reason. The building shaped like a quarter-circle near Grand and Natchez is a remnant of a local line abandoned by the Soo-Line (Canadian Pacific) in 1999. The other Chicago & Northwestern line to Evanston, the one beginning at Mayfair Junction, has some notable remnants in architecture near Devon Ave and US 41. 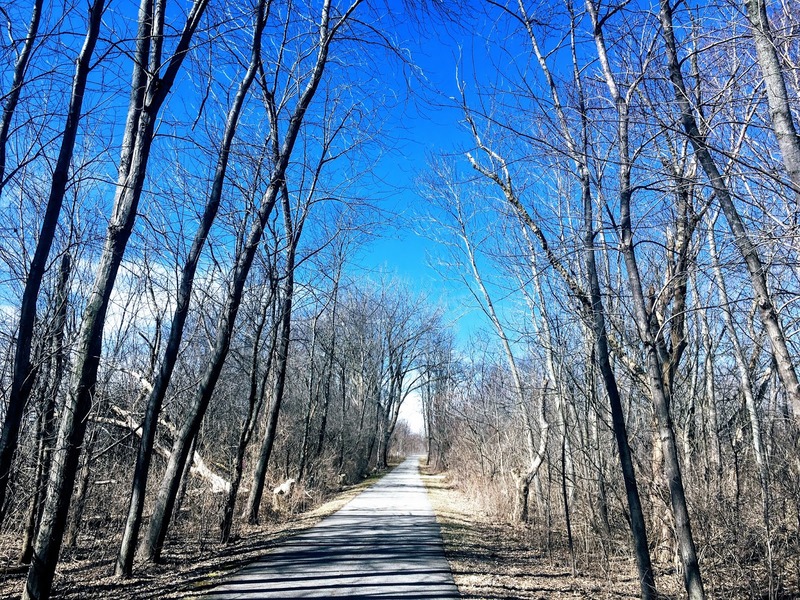 Much of the right-of-way has turned into a rail trail. 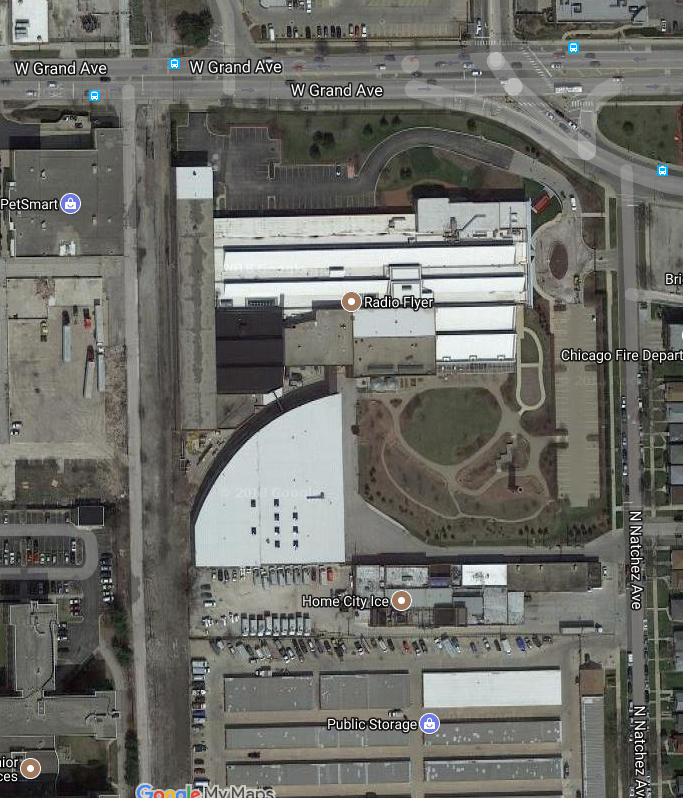 Let me know if you know of any other examples of scarchitecture, both in the Chicago area and in your own neck of the woods! 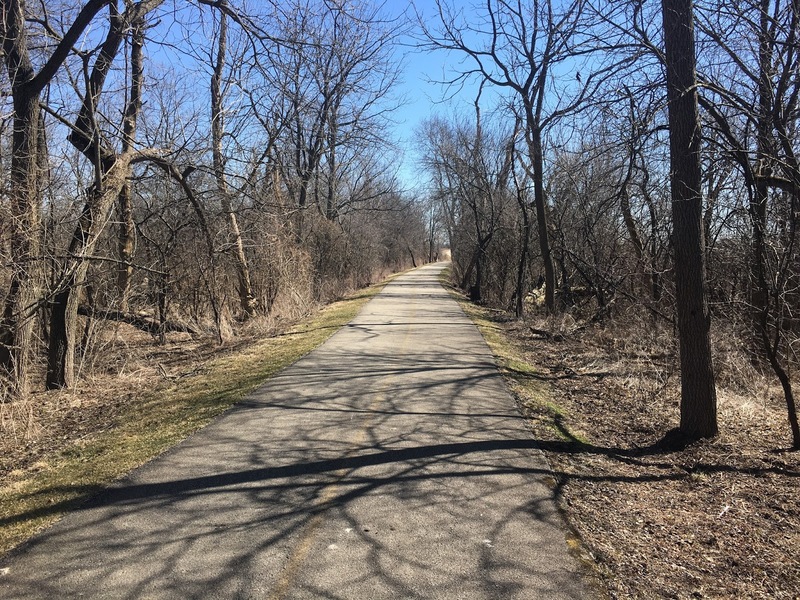 The Chicago area, like many others, is full of abandoned railroad corridors, plenty of which have been converted into biking trails, or rail-trails, the most famous of which is the Bloomingdale Trail, otherwise known as "The 606". In my humble opinion, it's a nice hike but not my favorite trail to walk on. Having lived in the Chicago area my whole life, I've had the joy of being able to discover Chicago's historic railroads as well as it's many active lines that are perfect for viewing trains! The criteria I used to evaluate might be a little different than most people's, given that I'm seeing the trails through the lens of the railfan. The most important things for me, other than safety and cleanliness, are 1) How close the trail gets to other active rail lines. 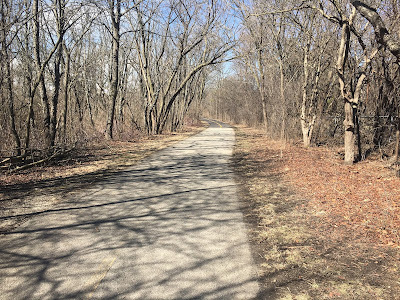 2) How well the trail relates to the history of the railroad than once ran on its right-of-way, and 3) The area around the trail, and whether or not it has amenities and areas to explore. 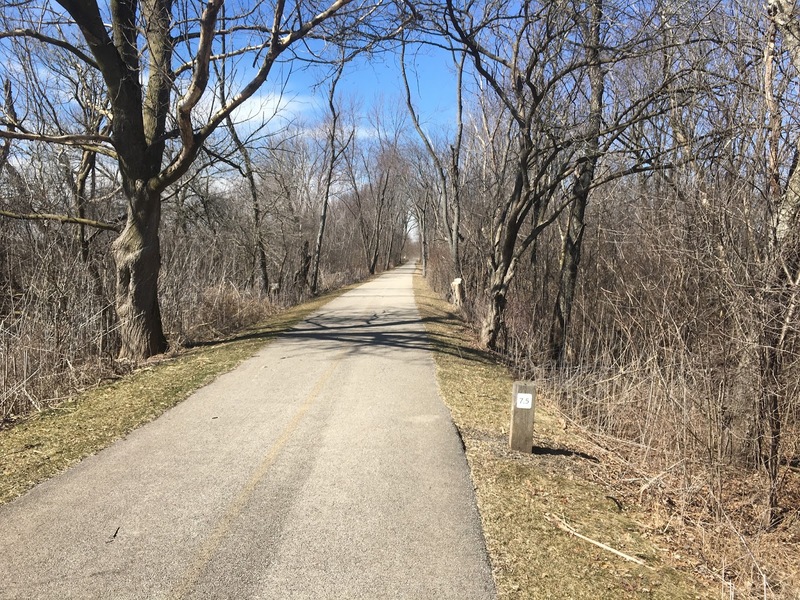 So without further ado, here's my list of the top 10 rail trails in the Chicago area. Although much of this right-of-way is still active between the two trails, I combined them into one given how it was once entirely the Chicago & Northwestern Railway. In Algonquin, the Prairie Trail goes around and under the IL-31 Bypass next to the Fox River and over Algonquin Rd, creating some excellent and unique views of the area. 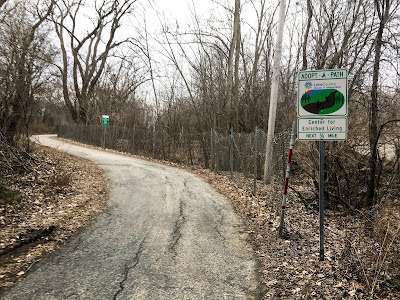 In Lake Geneva, the history of the line is well preserved both in the downtown area and along the path, it's also nice because the trail usually isn't too crowded, which can help get you away from the always crowded downtown area. 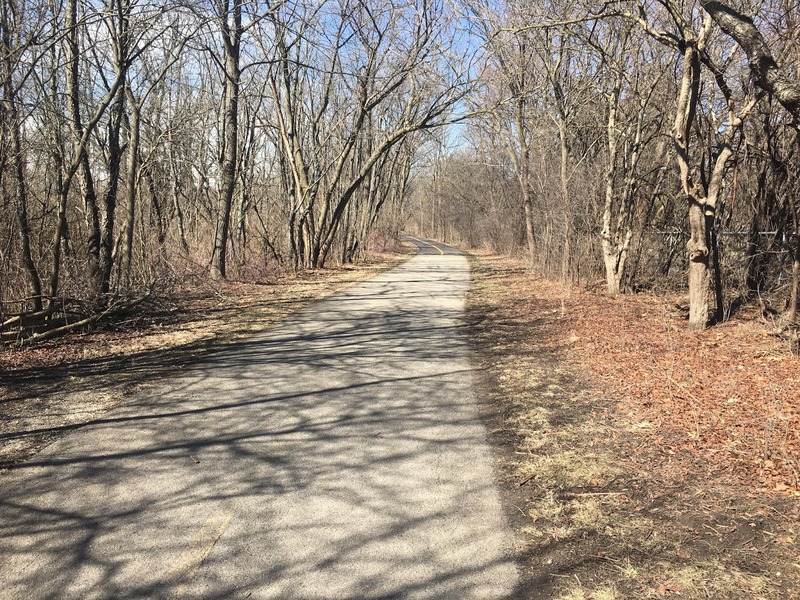 The Henslow Trail is a short trail occupying a small part of the former US Government Railroad Tracks in the former Joliet Arsenal. The highlight of this trail is the bridge over IL-53, which was the original alignment of the former US-66. 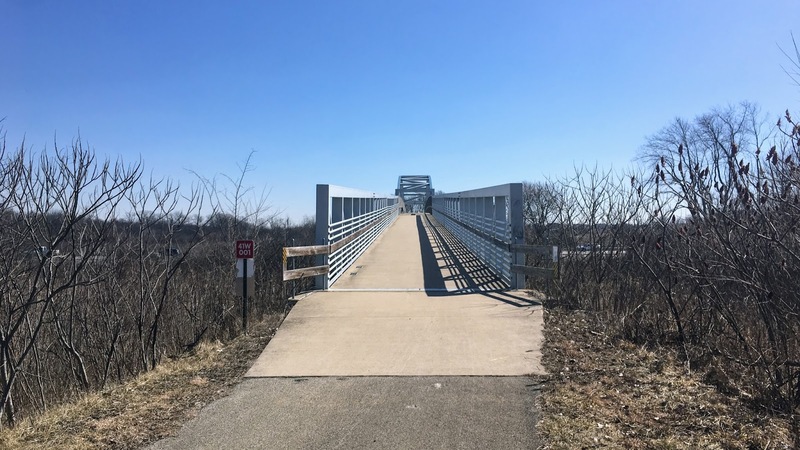 Generally, this rural trail doesn't offer much in the way of views, but it's historical significance to three major wars this country has fought, it's proximity to perhaps the most famous road in American History, as well as the Abraham Lincoln National Cemetery make it a trail worth visiting for sure. Occupying the former right-of-way of the Libertyville Branch of the Chicago North Shore & Milwaukee, the North Shore Bike Path primarily lies just to the south of IL-176. While the path itself is mostly treated as a sidewalk, there are some nice areas to walk over US-41 in Lake Bluff, as well as a trio of bridges in the Rondout area, where trail users walk over the Milwaukee District North Line and the former EJE Railway (now Canadian National). I personally prefer this trail over the Green Bay trail which it branches from, since that trail doesn't really offer much that can't be seen from a Metra train or from local streets. A linear park built over an abandoned stretch of railroad on the North Side of Chicago is an example of a rails to trails project gone right. The area is experiencing plenty of growth and development near the trail, and the ability to walk over streets is both safer for pedestrians, and gives an opportunity to see the neighborhoods it crosses in a new light. 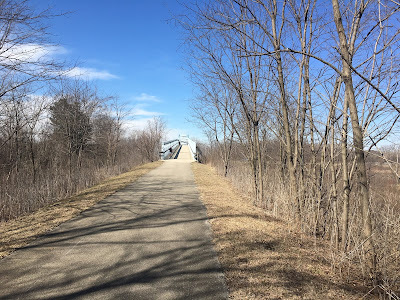 My biggest complaint about this trail is that it doesn't really keep the history of the Milwaukee Road and Canadian Pacific line that once traversed it's path. 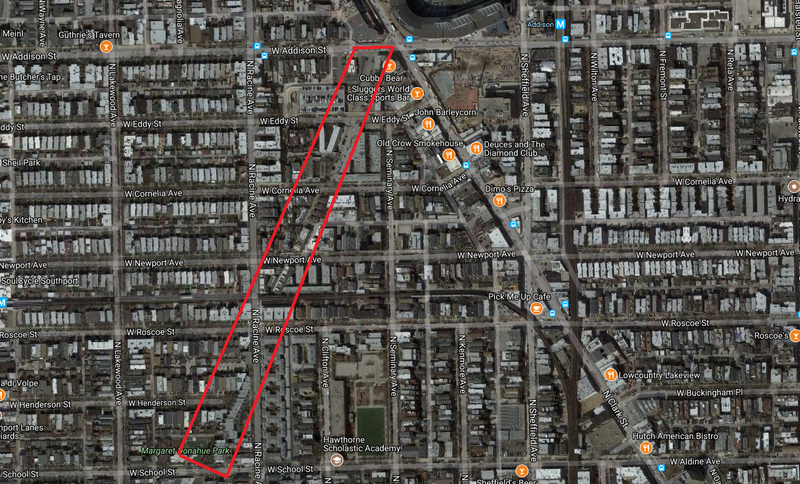 But it still is an interesting walk if you find yourself on the North Side. 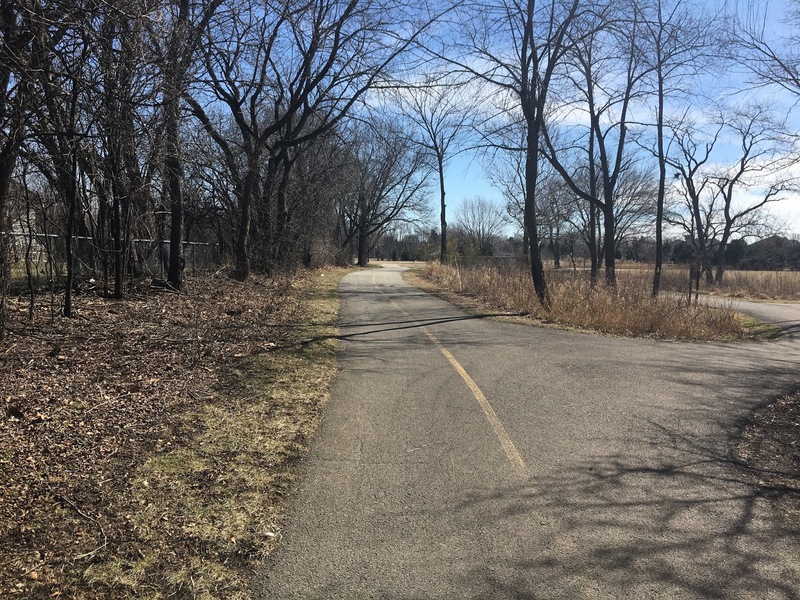 In my opinion, the Skokie Valley Trail feels more like a railroad than the Bloomingdale, which is aided by the fact that within Skokie, you're literally on the other side of the station for the CTA Yellow Line, or the Skokie Swift. This former Union Pacific and CNW right-of-way goes through the Sauganash neighborhood of Chicago, through Lincolnwood and onto Skokie, while the abandoned ROW continues into Lake County, IL. This trail uses the former "Gary Line" of the Milwaukee Road, as well as an interurban line which ran all the way to DeKalb. 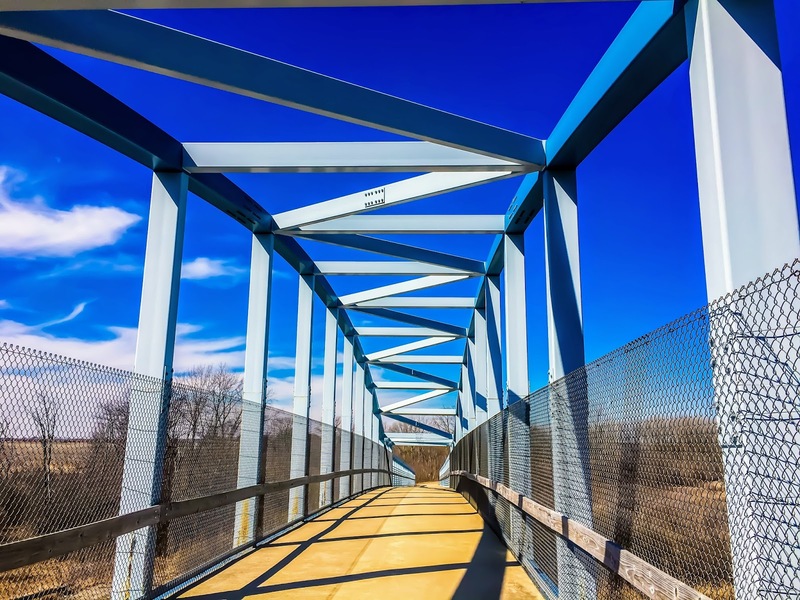 It has many bridges over the relatively congested roads in the Aurora and Sugar Grove area, and offers many unique views over it's surroundings. A BNSF line can be seen and heard in the western part of Aurora on the trail. The southern part of the trail uses the northernmost right-of-way of the EJE line to Normantown, IL. 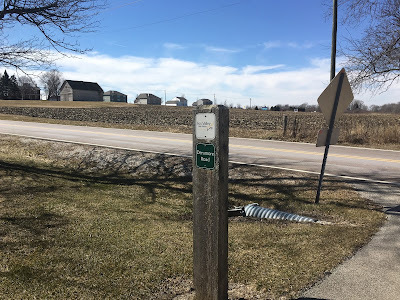 I believe this is the longest rail-trail outside of the Chicago area, whether it is or not, it is part of the longest abandoned right-of-way in Northern Illinois, extending all the way to Galena Junction. 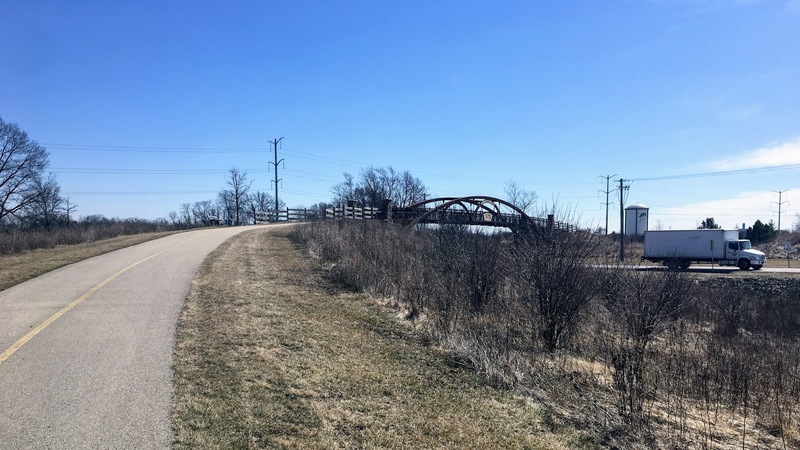 There is so much to see along this trail, my personal favorites are the view of the Union Pacific West Line in Lombard and the recently abandoned bridge in St Charles over the Fox River, which towers over the area. I hope it's incorporated into part of the trail someday. This is really perhaps one of the best rail-trails in the world for railfans. How many trails have a Trolley Museum with a heritage railway running right next to it? 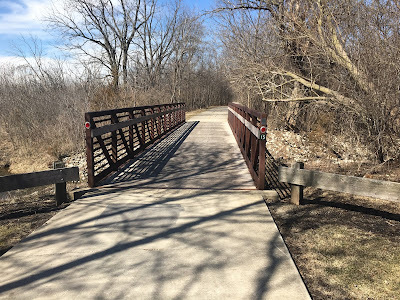 The trail incorporates the bridges of the former Chicago Aurora and Elgin Railroad really well, you can definitely get a feel for the history of the line, and that's before you pay a visit to the museum! What may seem cliche as a review of some other trails rings true here; the past is literally alive! The Fox River runs right next to it, and as such, this trail is prone to flooding, but that's about the only bad thing I can say about the trail. 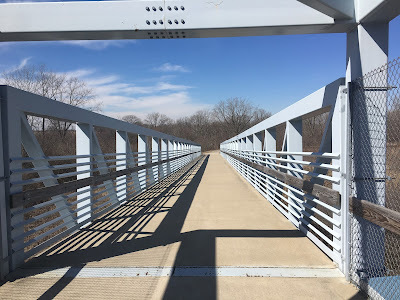 On a related note, this trail also links up with Red Gate Bridge, which goes over the Fox River, and allows pedestrians to cross under it, which is a really cool sight. 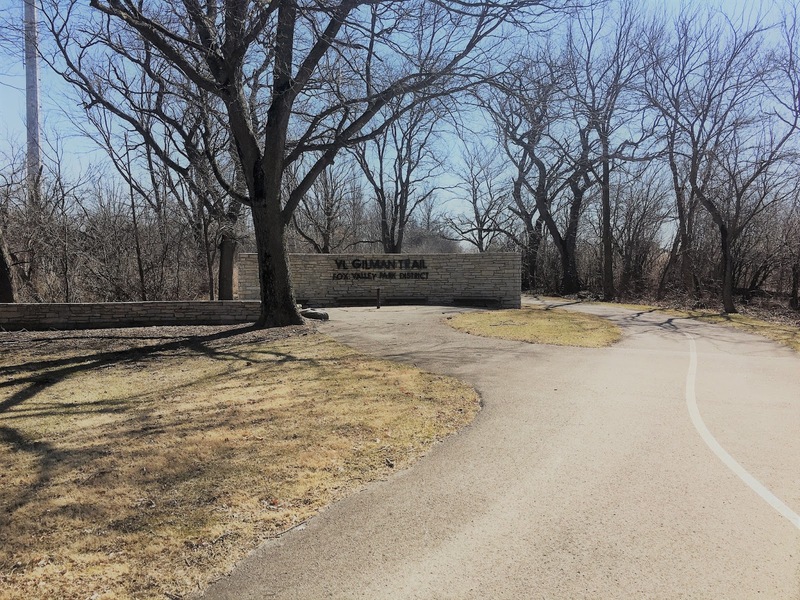 A walk on this trail is like seemingly walking back-in-time and yet well within the amenities and surroundings we're familiar with today. This trail incorporates the history of the towns it crosses through really well. A former Michigan Central and Joliet & Southern Traction Interurban line, this trail incorporates elements of the past while still being tied to modern times, which is an incredible feat in my book. 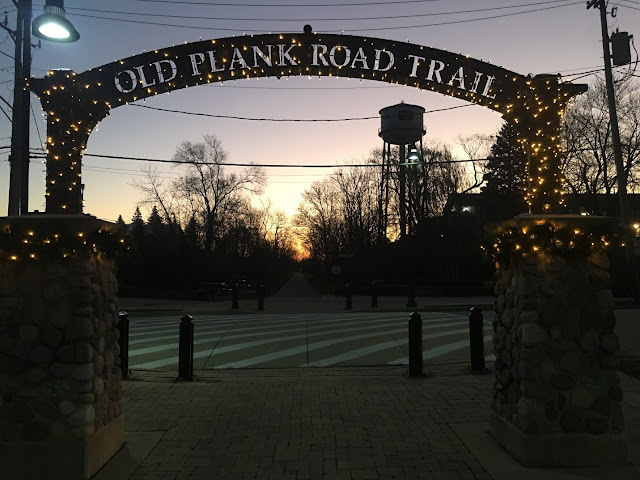 The town of Frankfort is absolutely gorgeous at night, and the trail offers front door access to shops, restaurants and a local concert venue. Definitely worth checking out! 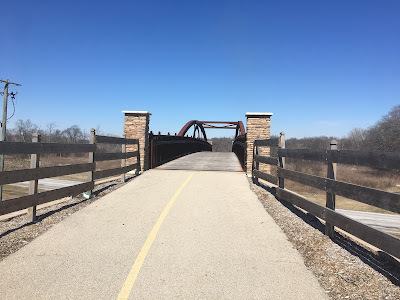 This trail offers my absolute favorite view of all time, as a chain link fenced bridge allows you access over the very busy Union Pacific West line. It is an awesome feeling to view freight trains a few feet below you traveling fast, and one of the few places where you can hang out and do this safely! On top of that, the line offers many historical nods to the past. 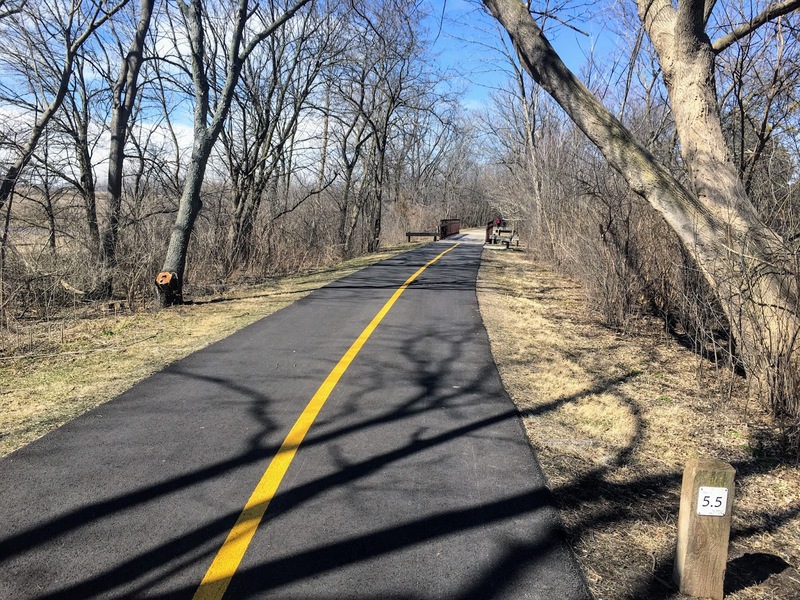 The trail also tends to go near downtown areas without actually entering them, offering peace and tranquility, yet also allowing accessibility to restaurants and Main Streets, an excellent balance for trail users. 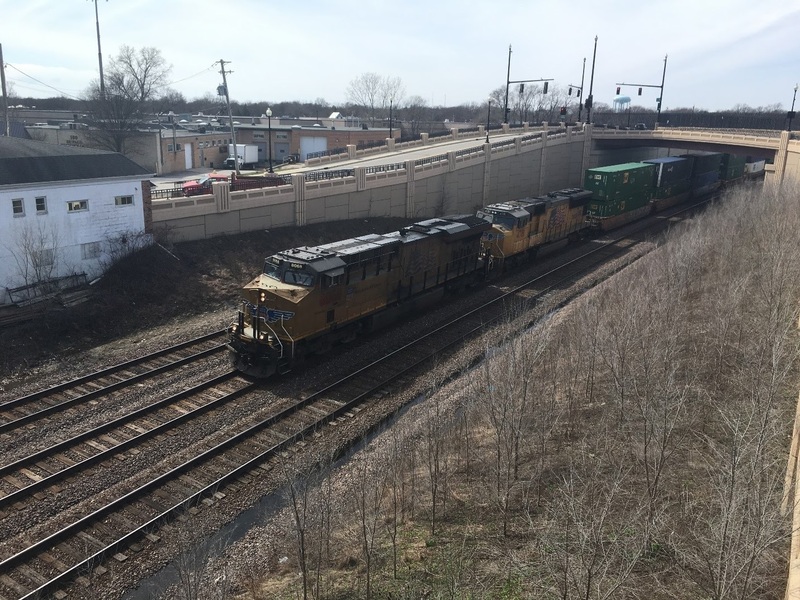 The trail enters Glen Ellyn on a bridge over I-355, IL-53 and the DuPage River, and is never too far away from the UP West line to get some really good shots of the line. This trail also connects with the Fox River Trail as well, so long distance bike rides are an option as well. I cannot recommend this trail enough. I hope you enjoyed my reviews and if you agree with me, great, and if not, I'd love to hear what you think are some of the best rail trails around Chicago! The abandoned Milwaukee Road corridor as portrayed on my Abandoned Railroads map. The Chicago Milwaukee & Gary line got its start as the Illinois, Iowa & Minnesota Railway in 1904. 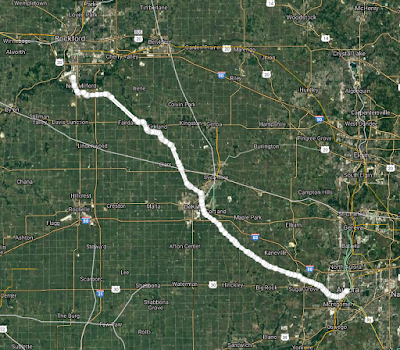 In 1905, the line was extended from Aurora to Rockford, IL and that is where this blog is going to focus on. The Chicago Milwaukee & Gary name as a railroad was a misnomer, as the line never actually traveled to any of it's namesake cities, although it did provide a line to bypass the heavy freight traffic around the Chicago area. 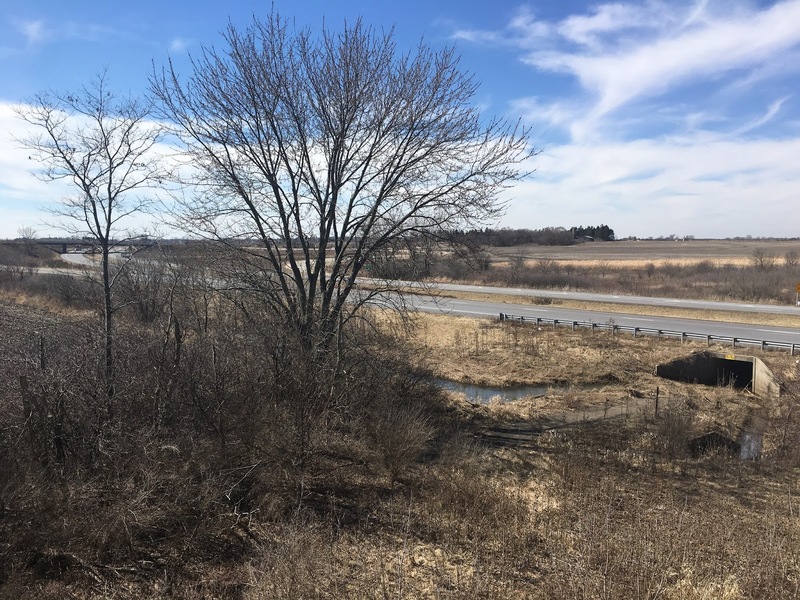 The railroad was leased to the Milwaukee Road in 1922 and eventually sold to them outright in 1930, who abandoned the Rockford to Kirkland line. The Milwaukee used the line for transporting coal from it's interests in Southern Indiana to it's more typically northern operations. The DeKalb to Aurora segment was abandoned in 1947, splitting the line into two disconnected short lines. By 1980, the line was abandoned as all traffic had ceased on the line. 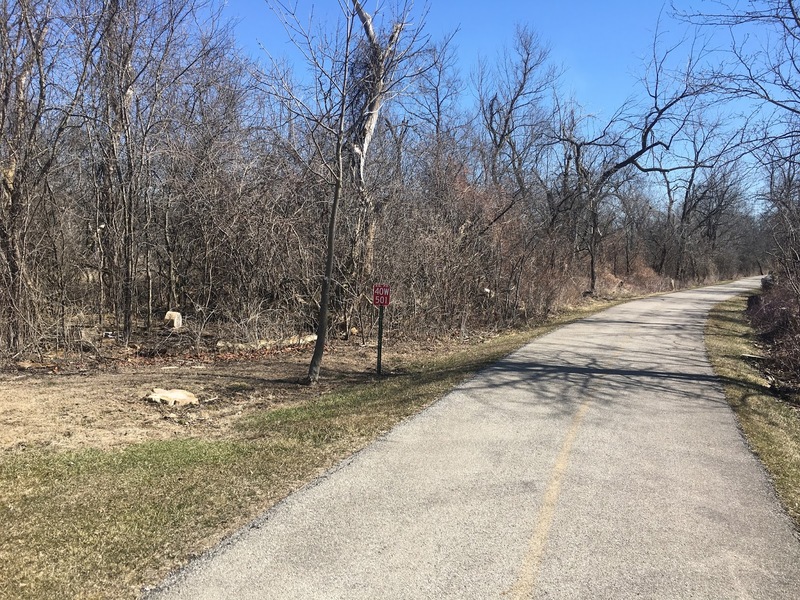 The right-of-way is now occupied between Aurora and Sugar Grove, IL by the Virgil Gilman Nature Trail. Virgil Gilman was an important figure for the Fox Valley Park District in it's early days. Much of the infrastructure of the trail was built after the days of the railroad; as such, the bridges have a modern look to them, and most are built with trail users in mind, as such, they are mostly just outside the original right-of-way, as can be seen in some of the pictures here. Looking south on the Galena Blvd bridge. 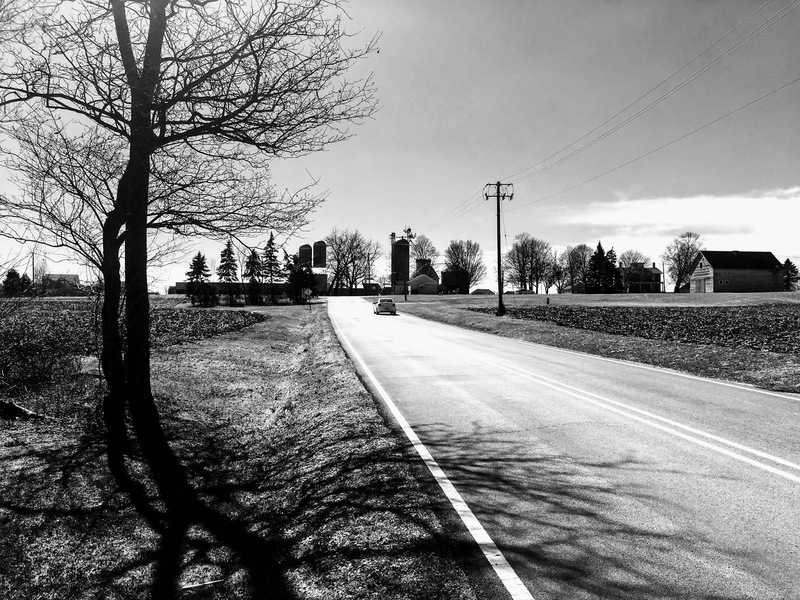 Looking south on Densmore Rd, the rural history of this area is still intact, although development is occurring on all sides of this farm. While on this March day I didn't have to worry about extreme temperatures, these trees provided excellent shade from the abundant sunshine. Approaching the IL-56 bridge. 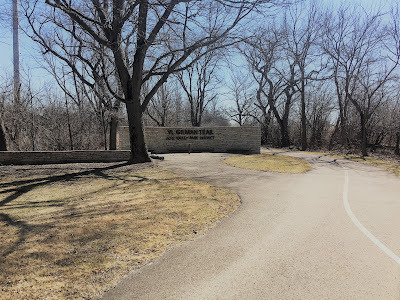 The trail ends slightly west of here, and no longer goes near the old right-of-way. The bridge itself is not entirely on the right-of-way, but actually about 50' north of it. The actual line can be seen going under IL-56 here. 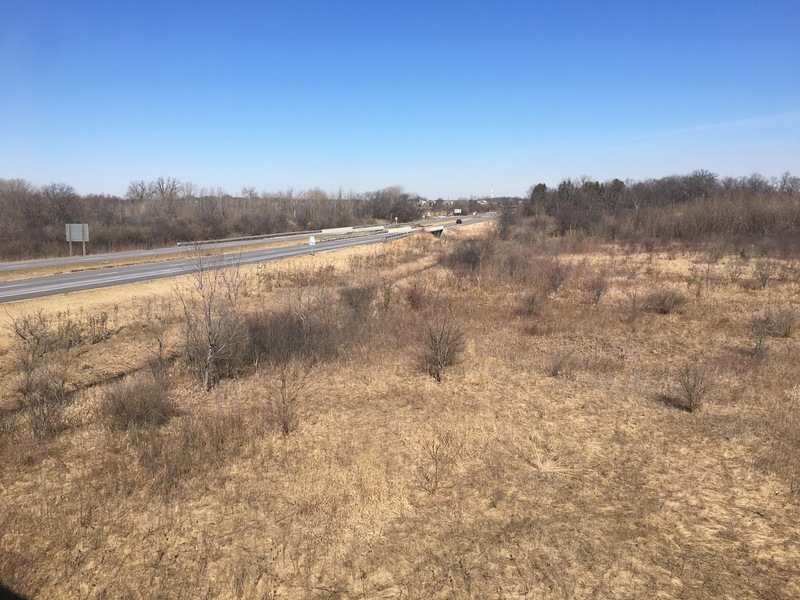 While Sugar Grove is a developing village outside Aurora, it doesn't need a 4 lane freeway to access it. Why then is IL-56 a freeway? This was originally the East-West Tollway, which started at IL-47 in Sugar Grove about a mile south of here and continued as Toll US-30, or present day I-88. When IL-5 which became I-88 was constructed west of here towards DeKalb, this little freeway was essentially a 4 lane spur to Sugar Grove. 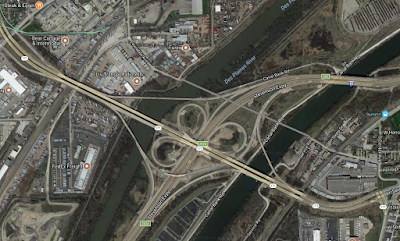 It actually USED to be Interstate Standard until Golf View Rd was built to connect with a subdivision to the west. 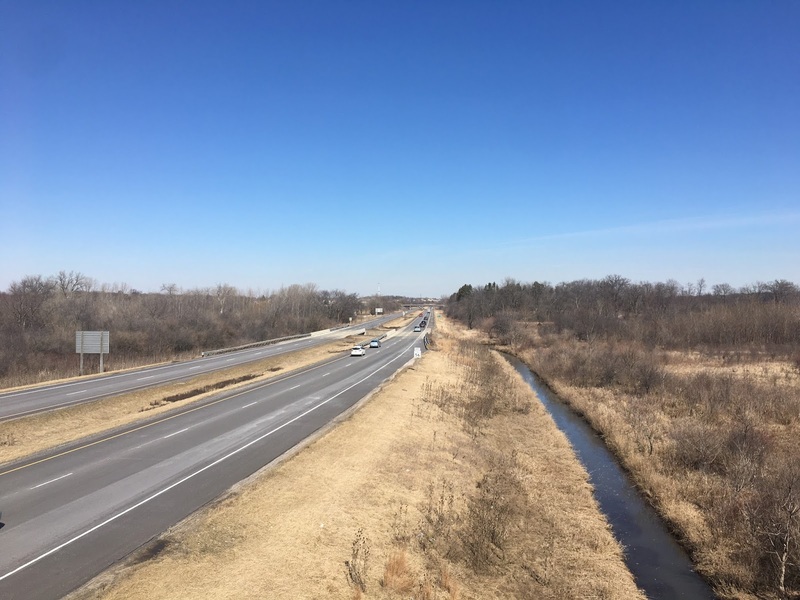 Looking south on IL-56 towards IL-47 at the Galena Blvd interchange. At the bridge over IL-56. 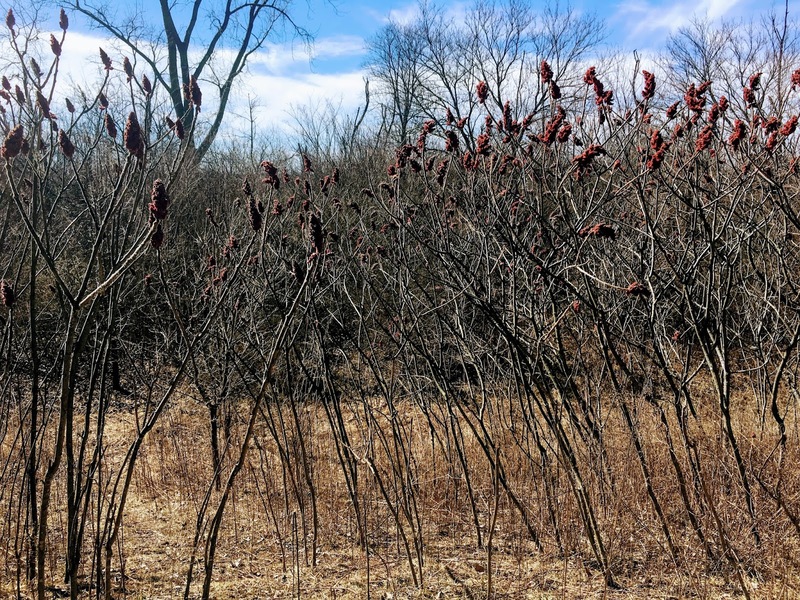 Prairie between the rights-of-way of IL-56 and the trail itself. Looking east now toward the bridge. If you look closely, you can note some of the original right-of-way of the line. The right-of-way meets up with the trail again past the bridge to the east. Back to the bridge over Galena Blvd. 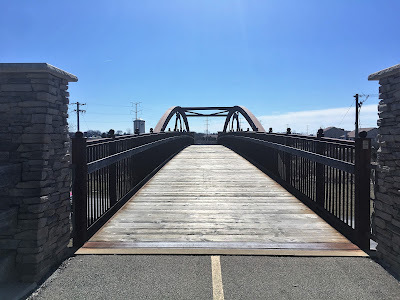 The bridge is not exactly over the right-of-way over Galena Blvd, but can be easily noted from the bridge given the design of the parking lot. A little more east at Prairie St. 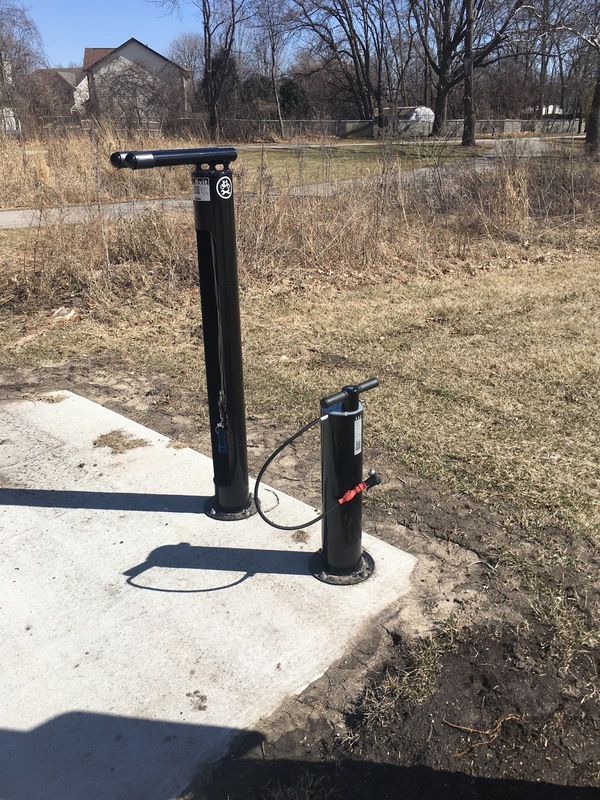 This is so cool and helpful to bike users, wish more of these existed! 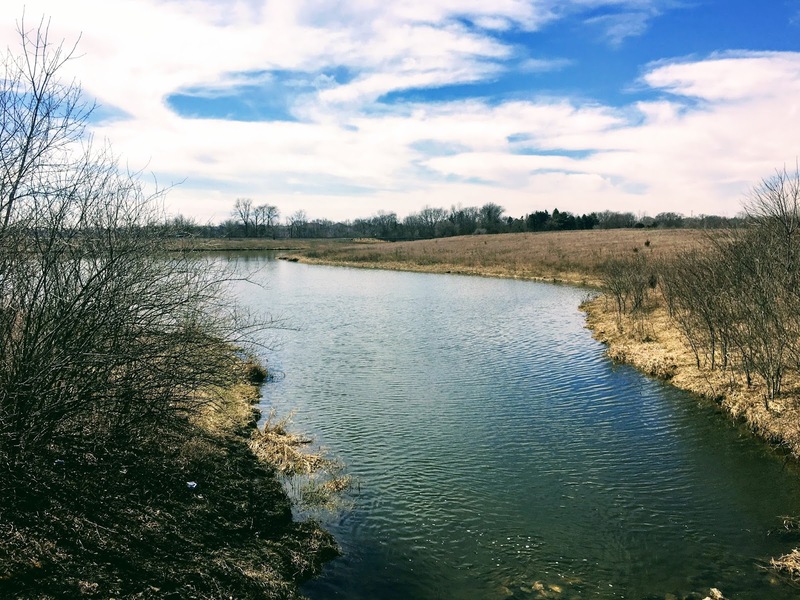 Looking south past this lake, if one looks closely you can see a railroad trestle for the BNSF Line. Trains can be heard from the trail here. On Orchard Rd under the bridge for the trail. 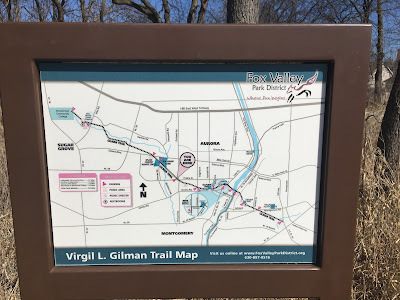 The trail continues into downtown Aurora, and the Virgil Gilman Nature Trail also uses part of the old Elgin Joliet & Eastern Line that ran to Normantown, IL as well.